A unique Winter experience, there are three different canyons to explore in the Banff area, each with special highlights! 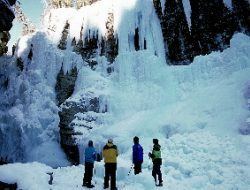 Walk on a frozen creek through a narrow gorge, past unusual rock formations, ancient Native rock art, and icefalls. The history of the rock art and the geology of the mountains are at your fingertips as the guides explain their mystery. Ice climbers can be seen scaling the frozen waterfalls. Hike on steel walkways built into the canyon walls that give an airy view of the canyon below. Travel through prime wildlife habitat on your way to the trail head and learn the clues to how Johnston Canyon was formed. This popular walk will lead you past the lower falls and to the breathtaking upper icefalls. Walk to historic Stewart Canyon Bridge under the night of the winter sky. 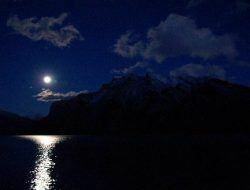 Explore along the shoreline of Lake Minnewanka, listen to the crackling of the frozen lake’s ice cap, and learn about the native history of the lake as your guide leads you to historic Stewart Canyon Bridge using headlamps. Finally warm up by the campfire, roast marshmallows, and savour a hot chocolate. Combine Banff winter tours for savings.